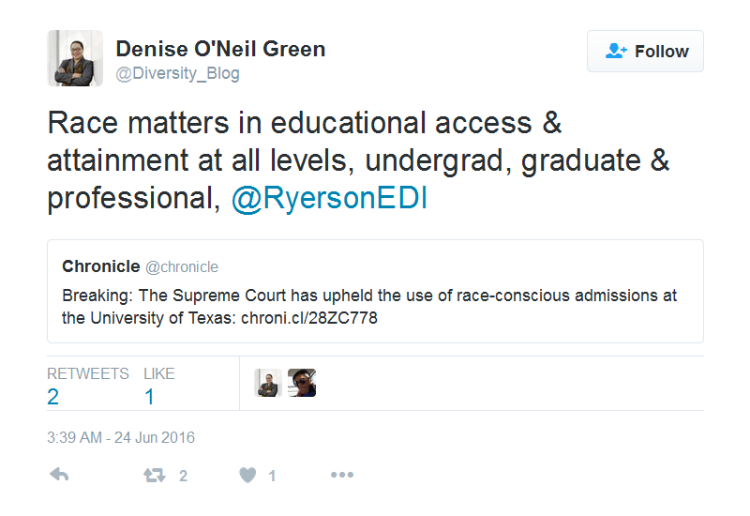 On June 23, 2016, the United States Supreme Court upheld in the Fisher v. University of Texas case the continued use of race-conscious policies in higher education. I must admit that I am somewhat surprised but given the balance of the court of liberal and conservative voices with the absence of Justices Kagan and Scalia, maybe this is what tipped the scale. This decision, at least for now, validates that race in education access and attainment at undergraduate, graduate, professional, and military school levels still matter. In 2003 the U.S. Supreme Court rendered the Grutter decision, establishing the framework for why race-conscious admissions policies and practices matter. While case law does not allow universities in the states to legally and directly address societal wrongs, it has allowed universities to consider race as a factor in admissions because the diversity in the classroom directly impacts learning, critical thinking, and the quality of educational experiences. With this decision, Grutter continues to be the seminal case. Cornel West's 1994 book Race Matters, which delves into why affirmative action or race-conscious policies – NOT QUOTAS – are needed to dismantle or disrupt systemic racism, outlines that ignoring race doesn't solve the problem of racism. Recognizing the construct of race and how racism is embedded in government, business, and educational systems are first steps at addressing systemic barriers and institutional/structural racism. While the educational diversity rationale trumps the rationale of correcting societal (historical) wrongs, and U.S. selective universities may continue to use race conscious admissions policies and practices, we must set our sights beyond affirmative action and the educational rationale. In a world that is becoming more diverse, with fewer resources, immigration challenges and fear of “the other”, universities and colleges are needed to lead and help its citizens understand that equity, diversity, and inclusion are not luxuries but required for all of us to thrive and live together. What did you think about this latest Supreme Court decision?